That means that your custom fields are fully integrated to all the features in your dashboard and are available in all the reports you might want to have them included in. If you're not yet using custom fields, now is a good time to give them a try! Once you add a custom field to a board or project, it is imported to your dashboard during the next data sync (the data is synced once per hour and you can trigger sync manually anytime at the integration settings). Once synced, your Drop down custom fields become available for grouping and filtering data. Number custom fields can be used for e.g. assigning estimates, or other kind of weights such as monetary value for individual tasks. To set estimates using a custom field, first assign a value to each of the tasks in your project. The default value is zero if no value is given. Screenful will automatically make all Number fields available in the Unit field in the chart settings. If you have a Dropdown field that you'd like to use as a Unit, you can change the field mapping. Instead of just seeing the total number of tasks, you can now see the total estimated work per tasks per individual. Custom fields allow you to associate your own data with the tasks and have them reported in your dashboard. It is a great way to extend the data available for reporting in your dashboard. 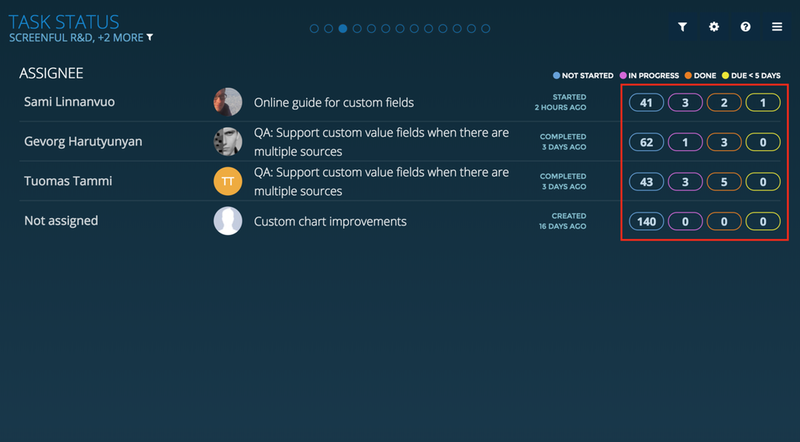 This chart is grouped by Category, a drop down custom field added to the Asana project. The breakdown overlay shows the number of open tasks per Category. This is just an example of how you can extend your task management tool's core features using custom fields, in this case assigning tasks to Categories. You can probably think of many other uses for custom fields!